Market beating portfolios and stock analysis based on strategies of legendary investors like Warren Buffett, Benjamin Graham and Peter Lynch. Analysis using 10+ guru models. 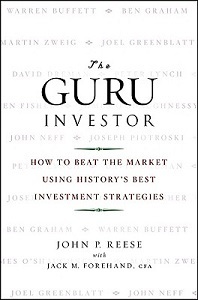 Validea researched history's top stock pickers and developed computer models that mimic the approaches these gurus used to beat the market over lengthy periods of time. Subscribing to Validea is like having these experts as your personal financial advisor. Analysis of any stock using the proven strategies of investment legends like Warren Buffett, Benjamin Graham and Peter Lynch. Screen for stocks that pass the strategies of investment legends such as Joel Greenblatt, James O'Shaughnessy and Martin Zweig. Our Hot List portfolio, which combines all our guru models into one market-beating system, has substantially outperformed the TSX since its 2010 inception. Daily updates on which stocks have been upgraded or downgraded by our guru-inspired models. When a stock's fundamentals falter, you'll know right away.